Inspirational Beading: Putting an End to Beader’s Block? Long time reader and follower, but perhaps the first time commenting. Welcome back. I have always enjoyed your posts and seeing what you've made (and your work is very inspirational). I have been beading for close to thirty years and there have been times when I've simply had to put the beads away for a long time (sometimes years). Life can get in the way, inspiration dries up, other interests take up time. But I always come back. I'm delighted to see that you have gone through something similar, made some excellent decisions, and have picked up needle and thread and beads again - for your own personal enjoyment. So glad you are back. I have been in a slump too. You have inspired me, Mortira! I too have been in a slump of a life time. I have tried everything. I even tried the tv tray at the couch with Netflix (i love Netflix). I even decided to pull out all my newelry thst needed a new clasp, anew bead or a little fixing nothin major hoping that would jumpstart zomething. I went through my binder of drawings looking for inspiration nothing. Its been almost 3 months. Im now hoping with the summer months coming and im not allowed outside over 85 degrees (due to an illness) it will bring back something. Hey, Morti! It's good to see you back! I hear you about a creative block! After a full fall/winter show schedule, I had a huge block as well - the Muses went on a very extended vacation. I didn't make anything new for close to 3 months (although I was able to still add things to my shop photographing things that didn't sell at the shows). Have taken a lot more time off this spring and greatly reduced the number of shows (only did 2!). And it feels GOOD! Your new work is beautiful. Look forward to seeing your posts. I enjoyed reading your email Mortira. Good to know you're beading if and when you feel like it. 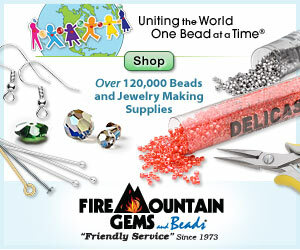 I hope to continue to use the Inspirational Beading site to learn more about beading. It's a fabulous place for a fairly new to bead weaving beader to visit. I'm working on a colourful cat 2 drop even count peyote cuff and a circular peyote rope to which I'll be adding a beaded cabachon. Wishing you good health and happiness. i'm so glad you're back! i was getting concerned about your existence honestly. i've had many ups and downs with creative block. i'm still in the midst of a decade or so of writer's block sadly. my bouts of beader's block tend to be much shorter and i tend to be able to drag myself out of them by working on something mindless like a spiral stitch rope. right now i'm working on beaded bezels for my stockpile of polymer clay cabs. of course that stockpile keeps growing since i keep thinking of pretty colour combos to swirl together. I have been in a creative halt myself. My husband bought me a puppy (4 years ago) and it's nearly impossible to do any beading because he wants my attention. I smiled when I saw your bangles because that's exactly what I did !!! I could squeak out a couple before his attention span for resting exhausted. Oh sure, some earrings here and there maybe a single strand bracelet but it's something !!! Let yourself float and you will reawaken !!! A new puppy begging for attention sounds like the BEST excuse possible to not be able to focus on beadwork. My dogs are 10 years old now but the neighbors just got a puppy. It causes them to act like a puppy again when they see her. It's wonderful. But then, I do get to go back inside and they are quickly napping and letting me get down to bead business.